These just didn't fit in anywhere else. 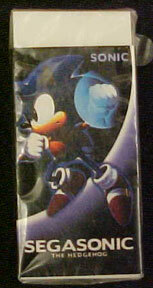 Odds and ends of Sonic the Hedgehog merchandise from my collection that are none-the-less interesting. Mostly collectible nick-nacks of fun. Alarm clock that isn't digital! 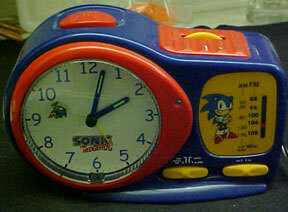 It has a Sonic hand for you to set the alarm with (Note the yellow second-hand) and a radio with snooze feature. Plug it in, or use batteries. Discovered at Sears in the 1990s, as a 'last item off the shelf' so it has a small scuff on top. Fancy Japanese Erasers! 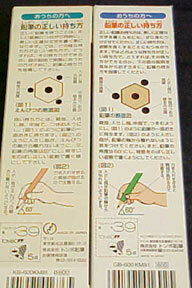 This is the front and back of the same eraser. Japan seemed to invent the trend of placing a plain white eraser in a cardboard cover, and then pulling out all the stops while designing it. Love the rare art they used too. 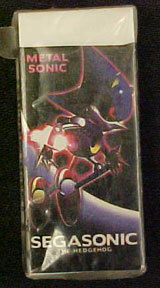 Plenty of the highly-cool but underused Metal Sonic to be found lurking on your school supplies. 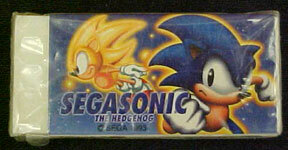 Plus, you almost NEVER see Super Sonic on items, but there he is. Stickers from Hot Topic. About 3 inches in diameter each, they came in a smaller version as well. Tough and sturdy looking. Want these? Click the Hot Topic link above right away. Some cool pencils from Japan! Tombo, of course made them. These are all eraser-less and just have a wooden sawed off end. They are also slightly pearly for some reason. Check out the box-backs, why do they need THAT big of a detailed explanation. It's a pencil! My Humble Pog Collection. This is the not-quite-complete set of USA pogs. Given to me a long time ago by someone named Charmy Bee. Note: Sally on a Jet Ski. Hidden Valley Ranch Salad Dressing sticker. These came under plastic directly attached to the bottles. 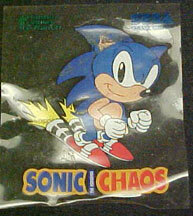 This one promotes Game Gear Sonic Chaos, but there were others. 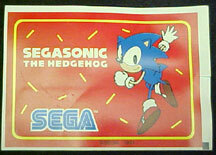 It is one of those infinitly re-stick-able plastic stickers too, handy. 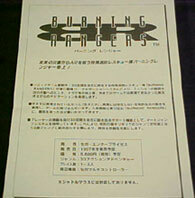 Rectangle Japanese sticker. It is paper based and fairly large. No clue what it's for. 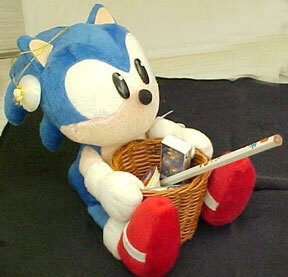 Sonic Plush with a basket. There was a whole series of these, but this is the only one I own. It's handy for storing your pencils, erasers and pogs. You can see the rest of these happy little baskets on the Japanese Sonic Plushes Page. 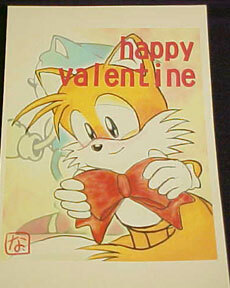 Ok so it isn't REALLY Sonic, but it's Sonic Team. 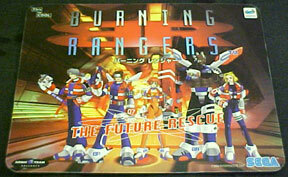 A Burning Rangers mouse pad. It isn't fake either! Check that certificate of authenticity! Actually, I have no idea what the paper says, but it did come with the pad. 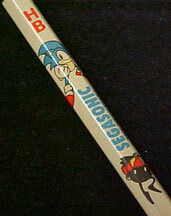 A Sega pen. 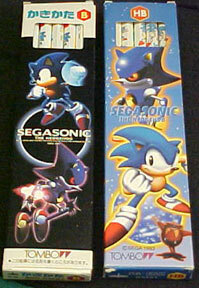 Just an ordinary, if thick barrel pen with "Sega" on the shirt clip part.